Geelong’s planned $171 million convention centre is closer to becoming a reality after a $48 million boost to a federal-state agreement this week. The 1000-seat centre would bring $350 million to the regional economy during construction and generate $50 million each year once operating, Victorian Treasurer Tim Pallas said. 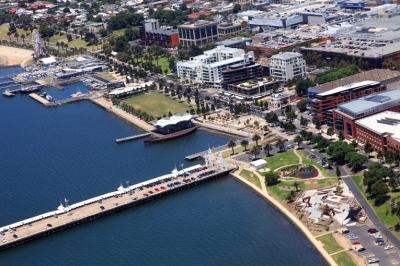 Last May State Government announced $153 million for a Geelong City Deal, while the Commonwealth followed in October pledging $154 million. The Commonwealth spend included $30 million for the convention centre amid concerns its contribution would not be enough. The additional $48 million this week brought the total Federal Government contribution to the $355.8 million deal to $183.8 million, with the Victorian Government providing the remaining $172 million. State Government will dedicate $141 million to the convention centre while the Commonwealth amount remains at $30 million, from their respective City Deal contributions. Elaine Carbines, chief executive officer of municipal alliance G21, described the City Deal announcement as “historic” for the Geelong region. “The benefits the deal will bring to the regional economy, both in the medium and longer term, can’t be overstated,” she said. G21 played a key role in “aggressively” lobbying government to have the deal “locked down” before the upcoming federal election, Ms Carbines said. Prime Minister Scott Morrison was please to work with the Andrews Labor Government and Corangamite MP Sarah Henderson “to get the deal done”, he said. But despite the state-federal cooperation Ms Henderson and Bellarine MP Lisa Nevile took aim each other’s government this week. Ms Neville blamed the Commonwealth for delaying funding for the deal while Ms Henderson accused State Government causing the delay by ignoring crucial projects.